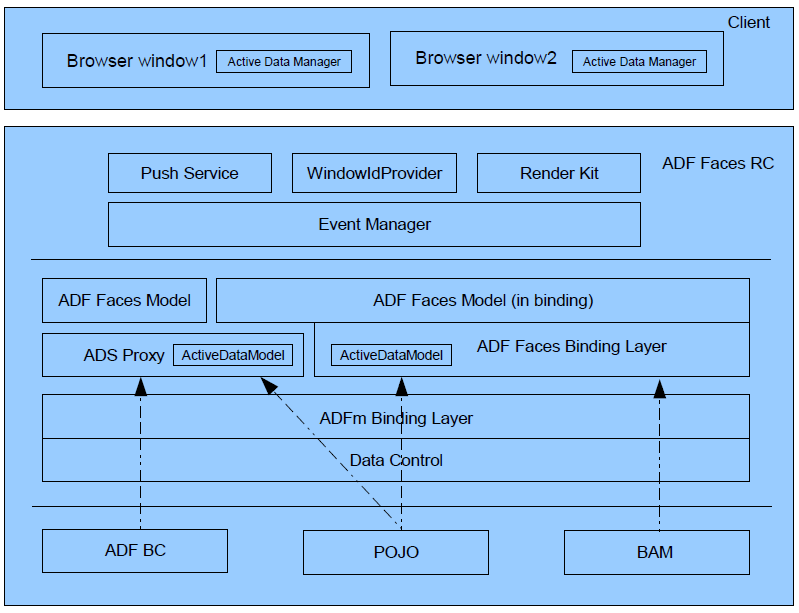 This chapter provides information for using the ADF Model layer and ADF Faces components with Active Data Service (ADS) in a Fusion web application. Section 42.1, "Introduction to the Active Data Service"
Section 42.2, "Configuring the Active Data Service"
Section 42.3, "Configuring Components to Use the Active Data Service"
Section 42.4, "Using the Active Data Proxy"
Section 42.5, "Using the Active Data with a Scalar Model"
The Fusion technology stack includes Active Data Service (ADS), which is a server-side push framework that allows you to provide real-time data updates for ADF Faces components. You bind ADF Faces components to a data source and ADS pushes the data updates to the browser client without requiring the browser client to explicitly request it. For example, you may have a table bound to attributes of an ADF data control whose values change on the server periodically, and you want the updated values to display in the table. You can configure your application and the component so that whenever the data changes on the server, the ADF Model layer notifies the component and the component rerenders the changed data with the new value highlighted, as shown in Figure 42-1. Using ADS is an alternative to using automatic partial page rendering (PPR) to rerender data that changes on the backend as a result of business logic associated with the ADF data control bound to the ADF Faces component. Whereas automatic PPR requires sending a request to the server (typically initiated by the user), ADS enables changed data to be pushed from the data store as the data arrives on the server. Also, in contrast to PPR, ADS makes it possible for the component to rerender only the changed data instead of the entire component. This makes ADS ideal for situations where the application needs to react to data that changes periodically. To use this functionality, you must configure the application to use ADS. If your application services do not support ADS, then you also need to create a proxy of the service so that the components can display the data as it updates in the source. The framework for ADS has the following limitations. ADS does not support active data for ADF Faces components added dynamically, using PPR. ADS does not support active data for ADF Faces components that appear in a web page or region that gets invoked from a task flow call activity. Do not use task flow call activities with bounded task flows when active data is required. ADS does not support active data in web browsers that have popup blockers enabled. Before users can run the ADF Faces page with ADS configured for the application, they must disable the popup blocker for their web browser. ADS does not support active data on ADF Faces table components with filtering enabled. Once a table is filtered at runtime, active data cannot be displayed. The framework for ADS contains a number of components that work together to send the active data from the source to the UI component. When a data event occurs, if the associated ADF Model layer binding is configured for active data, the Active Data model delivers the data to the Event Manager. The Event Manager then retrieves the data and invokes the Push Service, which delivers the data to the correct component, based on how the service is configured (for more information, see Section 42.1.3, "Data Transport Modes"). The component then applies the new data pushed from the server. Figure 42-2 shows the ADS framework. In order to use the Active Data Service, you need to have a data store that publishes events when data is changed, and you need to create business services that react to those events. By default, ADF Business Components does not react to data events. The Active Data Proxy framework allows all types of data sources, including ADF Business Components, to work with ADS. It combines the ActiveDataModel with the JSF model, so that you need to override functionality only on this proxy rather than on both the ActiveDataModel and the JSF model. Letting the renderer know whether the model needs active data or not. Active data is sent to the client using data streaming (push) or one of two types of data polling. With data streaming, there is only one request, which stays open. When a data change event occurs, a partial response is sent (the response is not closed), the client is notified, and the associated component is updated to show the new data, as shown in Figure 42-3. With data polling, the application is configured to poll the data source at specified intervals, as shown in Figure 42-4. 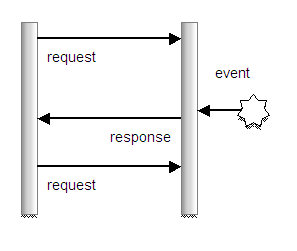 With each request, a response is sent and closed, whether or not a data change event has occurred. If the data has changed, then the client is notified and the component is updated. Long polling is similar to streaming. When the page is rendered, a request is sent to the active channel. However, a response is not returned until there is a data change event. At that point, the connection is closed. As soon as the connection is closed, a new connection is initiated, which results in the connection being active most of the time: there are no specific intervals. Long polling results in the majority of data change events being received when they occur, because the connection is already established and ready to send a response to the client, as shown in Figure 42-5. For more information, see Section 42.2.2, "What You May Need to Know About Transport Modes." To use ADS, you need to configure your application to determine the method of data transport, as well as other performance options.You also need to configure the bindings for your components so that they can use ADS. If you are using ADF Business Components, you need to modify your model to implement the ActiveModel interface to register itself as the listener for active data events using the Active Data Proxy. Oracle offers Oracle Business Activity Monitoring (BAM), which is a complete solution that provides the ability to create an active data store. For more information, see the Oracle Fusion Middleware Developer's Guide for Oracle SOA Suite. You need to configure ADS to determine the data transport mode, as well as to set other configurations, such as a latency threshold and reconnect information. If you enable ADS but do not configure it, the ADS framework will use the default values shown in Table 42-1. Configuration for running the Fusion web application with ADS in JDeveloper and Integrated WebLogic Server is done in the adf-config.xml file. For more information about the adf-config.xml file, including how to create one if you need to, see the "Configuration in adf-config.xml" section of the Oracle Fusion Middleware Web User Interface Developer's Guide for Oracle Application Development Framework. In the Application Resources panel, double-click the adf-config.xml file. Click the Source tab to open the file in the source editor, and create an entry for each of the elements shown in Table 42-1. Latency threshold in milliseconds. Active data messages with network delays greater than this threshold will be treated as late. Frequency in milliseconds for sending keep-alive messages when no events are generated. When <transport> set to polling, frequency in milliseconds of the poll request. Maximum period of time in milliseconds a client will attempt to reconnect the push channel to the server upon getting disconnected. Time interval in milliseconds to wait between reconnect attempts. Keep the following in mind when configuring the ADS. Set the latency threshold to more than 1000 to avoid frequent component refreshing. Set the keep-alive interval and reconnect wait time to be less than the browser's keep-alive timeout. Set the max reconnect time to be less than your web server's session timeout. Example 42-1 shows a sample configuration that has content pushed to the client. Create a properties file with an entry for the ADS configuration. From the Main menu, choose File > New. In the New Gallery, select General Category and then File, and click OK.
Name the file adf-config.properties and save it to the META-INF\services directory. Synchronize the clocks on the data server and on the application server. If these are not synchronized, then events may appear to ADS to have occurred in the future. ADS can use one of three transport modes to deliver active data to the component: streaming, polling, or long polling. When you configure ADS to use the streaming mode, data is pushed to the client whenever a change event is raised by the data. 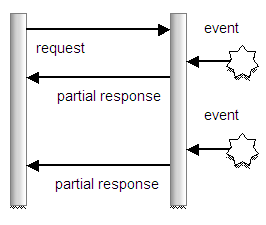 On the client side, after the push channel is established, if there is no activity within the time of the value for the latency-threshold element plus the keep-alive-interval, an establish-channel-request will be sent out repeatedly based on the value of the reconnect-wait-time element, until the amount of time passed reaches the value of the max-reconnect-attempt-time element. After that, the connection will be considered disconnected. For example, given the values in Example 42-1, if there is no activity in 15,000 milliseconds, an establish channel request will be sent out every 8,000 milliseconds for up to 90,000 milliseconds. After that, the connection will be considered disconnected. On the server side, the server disconnects the push channel and starts a timer to clean up with a cleanup-delay-time when there is an empty active data message or when it fails to send out an active data message. The cleanup-delay-time is calculated as max-reconnect-attempt-time + 30 * 1000 ms. Its default value is 30 minutes. When you configure ADS to use the polling mode, on the client side the polling request is scheduled to be sent out repeatedly after the value of the polling-interval element has been reached. If no response is received after the value of the max-reconnect-attempt-time has elapsed, the connection is treated as disconnected and no more requests will be sent. After receiving a polling response, if the time the response has taken is greater than the polling-interval element, the service sends the next request out right away. If it is less, the next request will be sent as scheduled. For the server side, the session ends after the polling response is returned. At that point, a timer with a cleanup-delay-time is set up to trigger cleanup. If a new request comes in before the timer fires, the old timer is canceled, and new timer is created. When you configure ADS to use the long polling mode, requests are made as they are in streaming mode; however, as soon as the connection is treated as disconnected, a new connection is initiated. The result is a significant reduction in latency. Table 42-2 compares the three different modes. 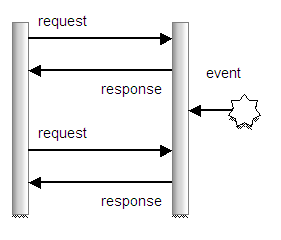 Directly after an event occurs on the server side, a partial response is sent to the client. If there is another event, immediately, it is also sent as a partial response. There is almost no latency with this approach. Poor, depending on the polling interval. If the polling interval is short (for example, 0.5 seconds), it will slow down the network because the connections are repeatedly opened. It is also expensive on the client- and server-side resources. However, when there is a new event immediately after a response has been closed, there is some latency until the new data appears on the client side. On average, this is not a problem. For some older servers, because the response is never released, when a proxy is sitting between client and server, it is possible that the proxy will buffer responses. This is an unfortunate optimization that prevents real-time data from flowing into the browser. Long polling should be used if a proxy is used. Many concurrent connections, as the stream is always live. Connections are live only during the actual poll. Note however that if there is a high polling rate then the number of concurrent connections will also be high. Many concurrent connections, as the stream is almost always live. This can result in the display of a "busy" cursor or the animation of a browser's "throbber" icon. How you configure components to use ADS depends on whether or not you must use the Active Data proxy. If your application uses a data store that publishes events when data is changed, and your business services react to those events (for example, if your application uses BAM), then you do not need to use the Active Data proxy. If your business services do not react to those events (for example, if your application uses ADF Business Components), then you must use the Active Data proxy and follow different procedures for configuring your components. To use ADS without the proxy, you need to set a value on the binding element in the corresponding page definition file. Drop a component onto a JSF page. The binding represents homogeneous data (that is, only one rule), although an accessor can still access a like accessor. The binding rule contains a single attribute. The table does not use filtering. The tree component's nodeStamp facet contains a single outputText tag and contains no other tags, as described in Section 42.3.3, "What You May Need to Know About Displaying Active Data in ADF Trees." Open the page's associated page definition file. In the Structure window for the page definition file, select the node that represents the attribute binding for the component. In the Property Inspector, set the ChangeEventPolicy attribute to Push. You can use the statusIndicator component to indicate the server state. For more information, see the "Displaying Application Status Using Icons" section of the Oracle Fusion Middleware Web User Interface Developer's Guide for Oracle Application Development Framework. To use ADS with the proxy, you need bind the value of your component to decorator class that will use the proxy. For more information about this class, see Section 42.4, "Using the Active Data Proxy." to set a value on the binding element in the corresponding page definition file. Change the value attribute to be bound to a decorator class that you will create for use with the proxy. For more information, see Section 42.4, "Using the Active Data Proxy." When you create an ADF Faces tree (or tree table) component, you configure a nodeStamp facet, which is a holder for the component used to display the data for each node of the tree. Each node is rendered (stamped) once, repeatedly for all nodes. Because of this stamping behavior, only certain types of components are supported as children inside an ADF Faces tree component. When the tree component is not bound to an active data source, all components that have no behavior are supported. However, when you configure the tree to use ADS, only the outputText component is supported inside of the nodeStamp facet, as shown in Example 42-2. The nodeStamp facet must not contain any other tags. So, for example, active data will not work if you add panelGroupLayout tags to the nodeStamp facets of a tree configured to use ADS. After you configure your application and the component for ADS, whenever the data changes on the server, the component is notified and rerenders with only the changed data. In contrast, a component not configured for either active data or automatic PPR will need to be explicitly refreshed after a data change occurs. The explicit refresh will refetch all data that is visible on the client, including data that has not changed. Consequently, this will force the entire component to rerender. Additionally, when the component is bound to an active data source (with active data policy "Push"), the component rerenders with the new value highlighted. When the Fusion web application runs in the Google Chrome web browser and a user presses Ctrl+N (or Ctrl+T) to open a new window (or tab) and then copies the URL from the original window into the new window, active data in the original window will stop streaming. According to the Google Chrome process model, the new browser window will be created in a separate process and both windows will share the same HTTP session. However, because browser windows that are created in two separate processes cannot communicate with each other, ADS will become out of sync between the client and server and will stop streaming. As a workaround, to allow active data in multiple Google Chrome windows, before copying the URL from the original window into the new window users must press Ctrl-Shift-N to open the browser window in incognito mode (private browsing). Because Ctrl-Shift-N opens the window in a separate process and a separate HTTP session, ADS will not attempt to synchronize between the windows and streaming will be unaffected. You use the active data proxy when your business services do not react to data events. If you want your components to update based on events passed into ADF Business Components, then you need to use the Active Data Proxy. If your application uses BAM for the business service, then you do not need to use the Active Data Proxy. Starts and stops the active data and the ActiveDataModel object, and registers and unregisters listeners to the data source. Wraps the JSF model interface. For example, the ActiveCollectionModelDecorator class wraps the CollectionModel class. Generates active data events based on data change events from the data source. Manages listeners from the Event Manager and pushes active data events to the Event Manager. You need to implement methods on this Java class that registers itself as the listener of the active data source and gets the model to which the data is being sent. The Active Data framework does not support complicated business logic or transformations that require the ADF runtime context, such as a user profile or security. For example, the framework cannot convert an ADF context locale-dependent value and return a locale-specific value. As an example of complicated business logic, say you have logic that allows a user to move an order from open status to pending. This change results in an update event, which should cause the order to be removed from a data object called "Open Orders." The framework cannot handle this event type transformation based on business logic. Instead, you need to have your data source handle this before publishing the data change event. Implement the logic to fire the active data events asynchronously from the data source. For example, this logic might be a business process that updates the database, or a JMS client that gets notified from JMS. Create a Java class that extends the decorator class appropriate for your component. Example 42-3 shows a class created for a table. ActiveDataModel interface to enable ADS for the existing page. Implement the method that returns the model. Example 42-4 shows an implementation of the getCollectionModel() method that relies on expression language (EL) to avoid needing to typecast to an internal class. The method returns the DepartmentsView1 collection from the binding container. // This is EL to avoid typecasting to an Internal class. Create an inner class that is your own implementation of an ActiveDataModel class, which the decorator can use to start and stop the active data and connect and disconnect from the data source. This class should also use the changeCount API to maintain data read consistency, as shown in Example 42-5. For more information, see Section 42.4.1, "What You May Need to Know About Read Consistency." Implement the method that will return the ActiveDataModel class, as shown in Example 42-6. Create a method that creates application-specific events that can be used to insert or update data on the active model. Example 42-7 shows the triggerDataChange() method, which uses the active model (an instance of MyActiveDataModel) to create ActiveDataUpdateEvent objects to insert and update data. You will need to import oracle.adf.view.rich.activedata.ActiveDataEventUtil and oracle.adf.view.rich.activedata.JboActiveDataEventUtil to implement this method. Using active data means that your component has two sources of data: the active data feed and the standard data fetch. Because of this, you must make sure your application maintains read consistency. For example, say your page contains a table and that table has active data enabled. The table has two methods of delivery from which it updates its data: normal table data fetch and active data push. Say the back end data changes from foo to bar to fred. For each of these changes, an active data event is fired. If the table is refreshed before those events hit the browser, the table will display fred because standard data fetch will always get the latest data. But then, because the active data event might take longer, some time after the refresh the data change event would cause foo to arrive at the browser, and so the table would update to display foo instead of fred for a period of time. Therefore, you must implement a way to maintain the read consistency. To achieve read consistency, the ActiveDataModel has the concept of a change count, which effectively timestamps the data. Both data fetch and active data push need to maintain this changeCount object by monotonically increasing the count, so that if any data returned has a lower changeCount, the active data event can throw it away. Example 42-7 shows how you can use your implementation of the ActiveDataModel class to maintain read consistency. ADF components that display collection-based data can be configured to work with ADS and require no extra setup in the view layer. However, imagine that your JSPX page uses an activeOutputText component to display new counts based on a Java timer. In this case, you will replace the model layer with scalar or "flat" data that you display from a Java Bean. Use the ActiveModelContext API to register the bean with ADS so the bean (a scalar model) imitates an actual model. Implement a custom mechanism to push the data to the view layer. // Not needed. We do not need to connect to a (real) active data scource. // 2. Use ActiveDataEventUtil to create an event object to update the model. <af:document title="Active Data Visual Design Demo"